Win a family Portrait in the NEW Jude Gidney Photography studio in Uppermill. All you need to do is send Jude a photo of your family either by Facebook message or email jude@judegidney.co.uk , or come along to the WI Shop Local Festival, Civic Hall Uppermill on Sunday with part or all of your family. The prize includes a photoshoot, and 2 x 8×10″ Print. The winner will be contacted on the 1st April. You’ve got to be in it to win it so get sending now! The photo shoot is to take place within a month of April 2014 at a time mutually suitable to both parties in the Jude Gidney Photography Studio and, weather permitting, on location nearby. Only members of the family in the submitted photo or mentioned on applying at the Shop Local Festival, will be allowed on the shoot – extended family will require an alternative shoot at usual studio prices. The 8×10″ prints are of the winner’s choice from the images offered from the shoot. Extra prints, digital images available to purchase at usual studio prices. The prize is non-refundable and transferrable. This competition has no connection to Facebook or Twitter and is run solely by the Jude Gidney Photography Studio. The winners will be asked to sign usual terms and conditions of a Portrait-shoot, please contact the studio for a copy if required. The studio has two offers for the coming season – baby photography and family portrait sessions. Please book early to avoid disappointment, appointments are limited and are booking up fast. Either ring 01457 810094 or contact via the website . Gift vouchers are also available from £20. 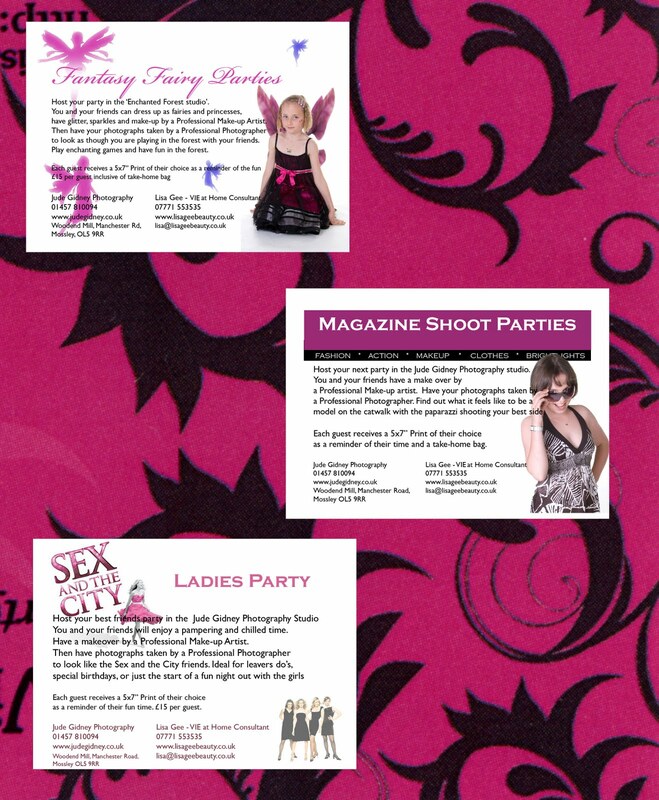 Introducing Studio Pamper Parties for all ages.